Are you looking for the most comprehensive, yet affordable Fiat servicing Poole has to offer? Then bring your vehicle to S and H Motors where we are the area’s leading specialists in Italian cars. Our team of engineers are experts on all things Fiat and Alfa Romeo, so we guarantee our Poole Fiat servicing will be thorough and professional to ensure your car is running smoothly. At S and H Motors, we are the perfect place for your Poole Fiat servicing needs. We pride ourselves on our professionalism and will always provide the most comprehensive servicing for all makes and models of car. Putting your vehicle in for a service is important for the overall running and efficiency of your car as an MOT will only ensure your car is safe to drive. Our Fiat servicing Poole technicians will enhance the performance and safety of your car. When you need your Fiat servicing in Poole, S and H Motors can do an excellent job to improve its longevity so that you can get the most out of your car. Our expert knowledge and high-tech systems that specialise in Poole Fiat serving as well as other Italian cars guarantees you the most in-depth service you have experienced. 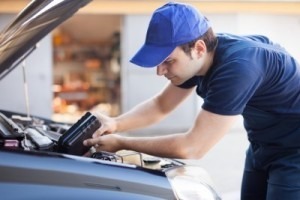 Once the main areas of the car have been checked, we will also look at your air and fuel filters, spark plugs and change the oil if necessary. Our highly-skilled workforce for Fiat servicing in Poole can detect damage and faults in the early stages, and if work is required, we can discuss this with you to come up with the most affordable solution. When it comes to Fiat servicing in Poole, our team have state-of-the-art technology to help maximise detection of faults in your vehicle. Our diagnostics equipment consists of a Fiat and Alfa in-house examiner system which is designed for specific fault detection in vehicles of the Fiat family. Our diagnostic Fiat servicing in Poole is half the cost of main dealers which is why we are the best Fiat servicing Poole has to offer. Our engineers will go the extra mile to provide top quality customer service and the smoothest running car you could wish for. To prolong the lifespan of your car we recommend our Poole Fiat servicing team examine your car once every 12 months so that it is always operating at its best. Our extensive checks will make sure that you don’t have to worry about forking out money on costly repairs throughout the year. Although we specialise in Italian cars, our Fiat Servicing Poole team are highly qualified and have over 30 years’ experience in carrying out services on all makes and models of vehicles. We will always aim to provide the most thorough service on all cars and to diagnose and repair any faults to the highest standard. Any repair work that is required will be discussed with you and quoted at the best possible price and comes with a 12-month guarantee. If your car requires extensive repairs, we will also provide you with a courtesy car while the Poole Fiat servicing team are working on your vehicle. S and H Motors aim to provide you with the most efficient and reliable Fiat servicing Poole has seen, offering a number of services such as MOTs and vehicle repairs. Our specialists will always give you honest advice on how to prolong the lifespan of your vehicle, so if you have any concerns regarding your vehicle, our Poole Fiat servicing technicians will be happy to help. For the most extensive Fiat servicing Poole has to offer, get in touch with S and H Motors today on 01202 680660.